Why use manual pit gauges when you can map corrosion with stunning 3-D mapping by Creaform? Laser corrosion mapping with Creaform Handyscan fundamentally changes the manual pit-gauge exercise. 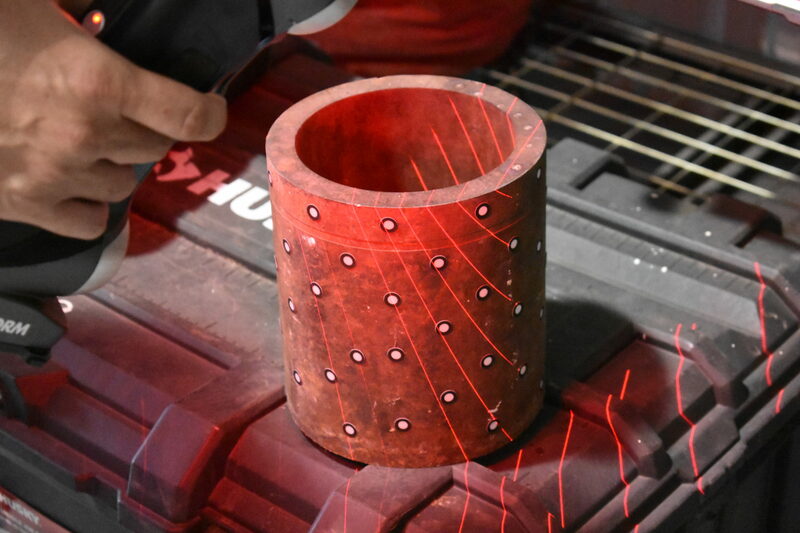 Instead of manually measuring depressions and features on the surface, which is wrought with user-inconsistency, Creaform laser corrosion mapping creates a 3-D model of the equipment piece. This model precisely indicates where corrosion is located, the number of features, the exact depth, and can single out the deepest feature on the scanned piece. This information reduces user-error and created an opportunity to more thoroughly scan for corrosion per API 579. 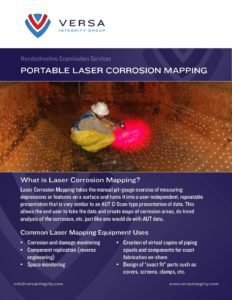 Furthermore, Creaform laser corrosion mapping can report findings in a variety of formats to suit your unique needs. If you simply require the raw data to input to your RBI system, we can provide that. If, on the other hand, you desire an entire 3-D model of the equipment piece to later be used for other purposes, we can provide that as well. The versatility of laser corrosion mapping system with Creaform is unrivaled by other NDT methods. Our use of the Creaform Handyscan for laser corrosion mapping applications has become well-established in the inspection and NDT industries. That said, we continually strive to push the technology for new applications that will benefit our clients. Our expertise in laser corrosion mapping has allowed us to take a 10-day API 579 inspection on a vessel column to 1 day! This considerable time-saving and more accurate corrosion mapping system undoubtedly reduces the cost for your API 579 inspections.